Vice President of the European Union (EU) Federica Mogherini has affirmed that the EU stands ready to upgrade ties with ASEAN to the strategic partnership level. The EU supports ASEAN’s development priorities, Mogherini, who is also EU High Representative for Foreign Affairs and Security Policy, said during a working session in Jakarta, Indonesia on April 9 with the ASEAN Secretariat..
Mougherini also pledged her own efforts to back ASEAN in the foreseeable future. While in Jakarta from April 8-9, she also held a meeting with permanent representative committees of the bloc. 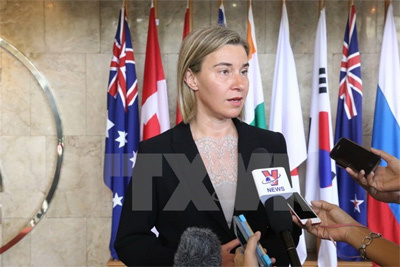 In a recent interview granted to the Vietnam News Agency, Mougherini said her visit is to reaffirm commitments reached by the EU and ASEAN last year. 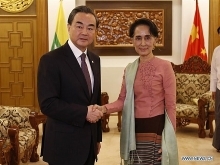 The EU and ASEAN are partners in ensuring regional security and stability, as well as in the fields of economy, trade and investment, she said, adding that both sides have committed to working closely together across the board. The EU is currently the second largest trade partner of ASEAN. Last year, two-way trade hit 201 billion EUR, up 11 percent year-on-year. During the 2014-2020 budget period, the EU committed 170 million EUR to ASEAN, compared to 70 million USD for 2007-2013..